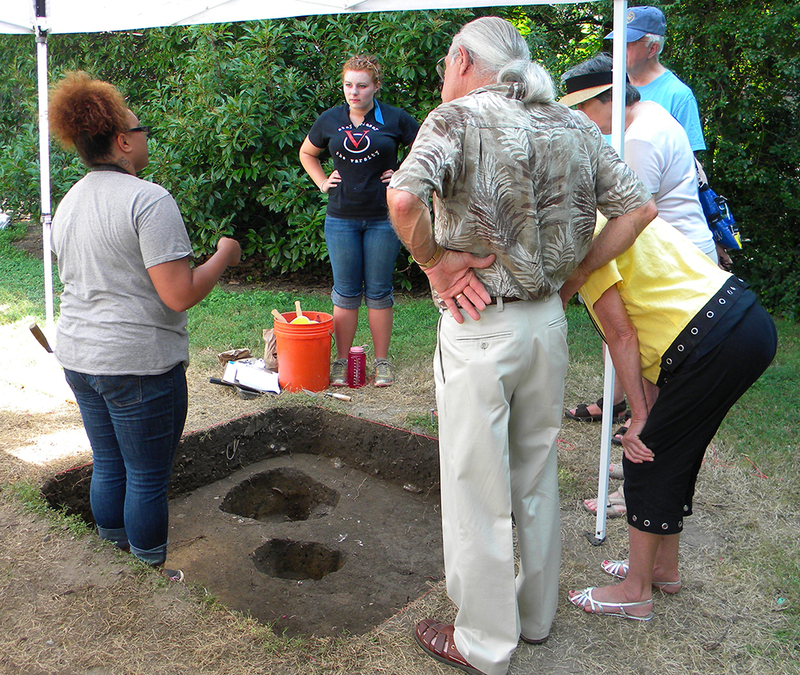 Below are photos of this year’s archaeological dig on The Hill in Easton, part of an effort to prove The Hill is the oldest community in the nation established by free blacks. 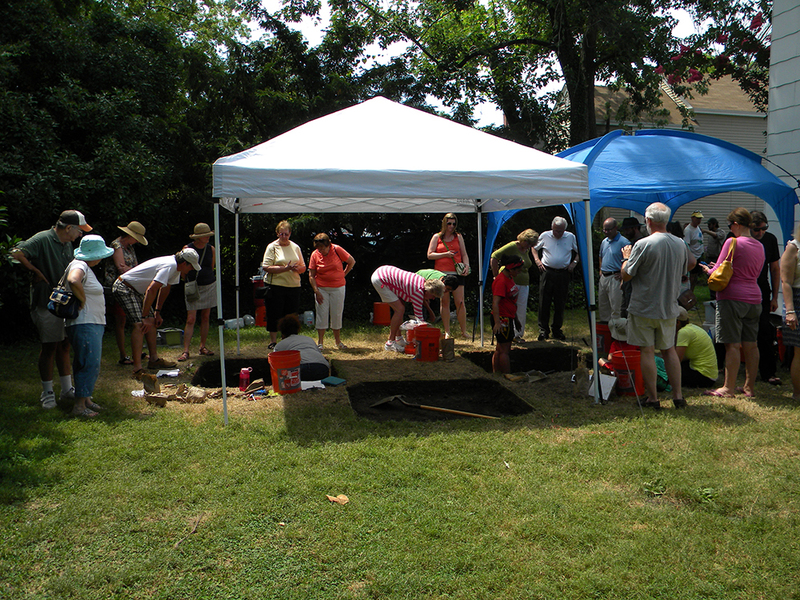 This year’s dig is taking place on the property of the Women’s Club of Talbot County (18 Talbot Lane). Residents of The Hill are believed to have lived and worked on the property and the archaeology students from the University of Maryland and Morgan State University are looking for evidence of their presence during the dig. 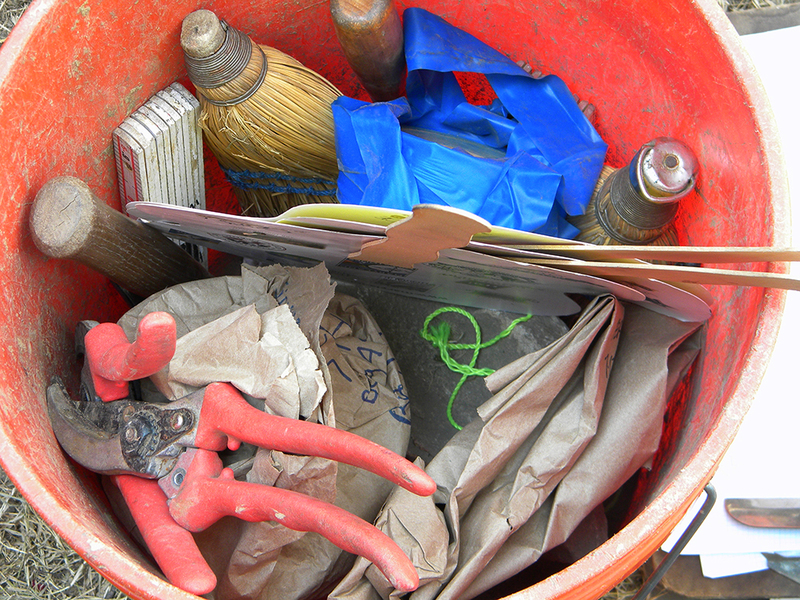 The dig will continue through Friday, July 26, and the public is welcome during the hours of 10 a.m. and 3 p.m. each weekday. The scene at the dig. Today was a special weekend open house for the public. 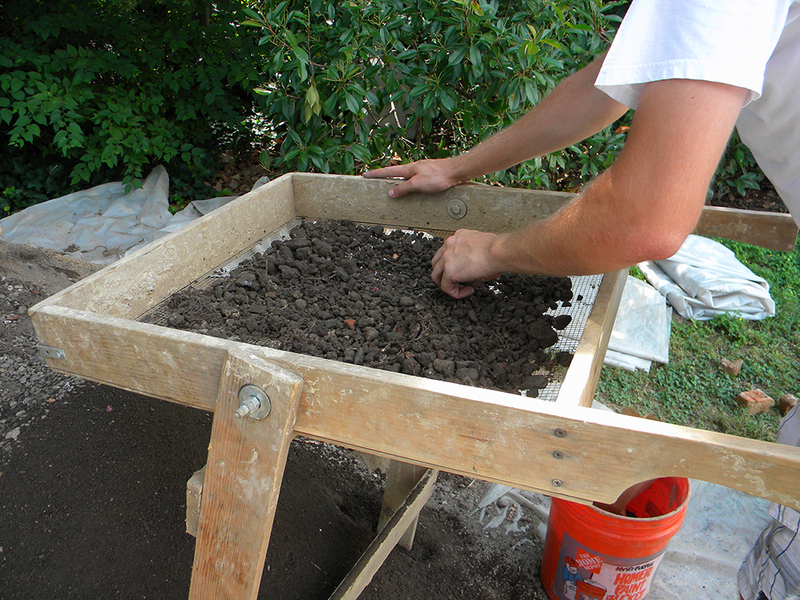 One of the students was sifting through the dirt that had been dug out of the test pits. 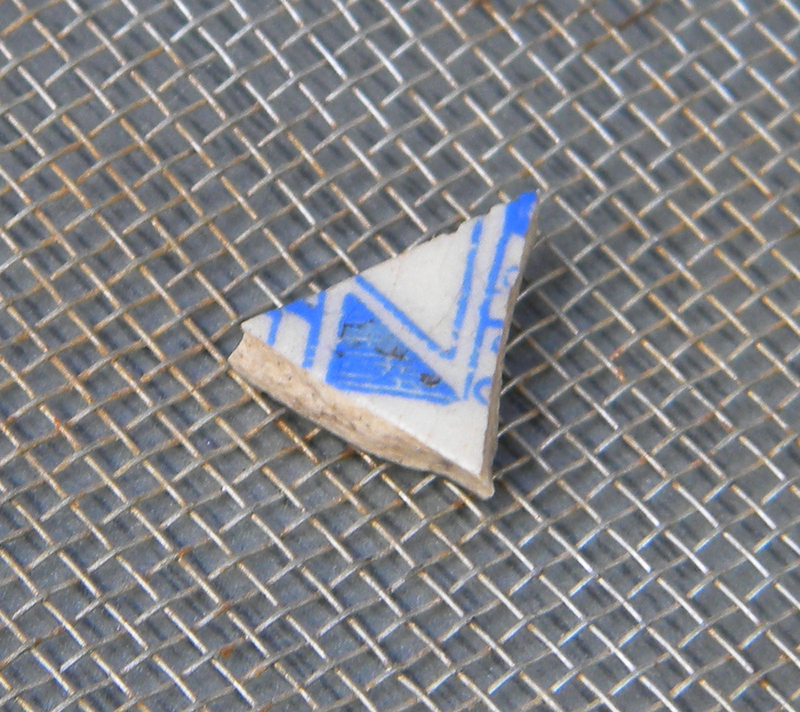 He found several pieces of pottery. He would lick them to see if they were porcelain. Porcelain pieces won’t stick to your tongue. 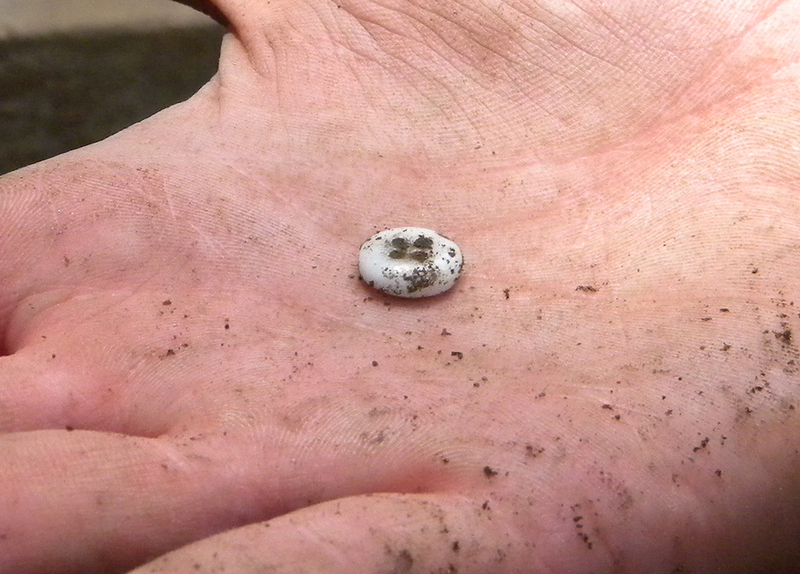 He also found a porcelain button. Other students were working in the test pits. Morgan State student Brittany explains what they’ve found so far in this photo. This test pit is a tricky one to work in due to the tree roots. 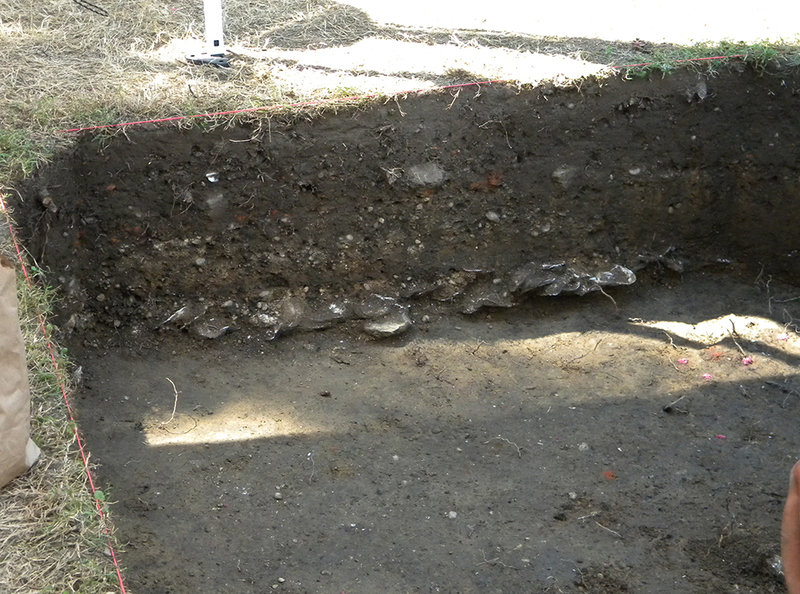 The students are finding a lot of oyster shells in the test pits. 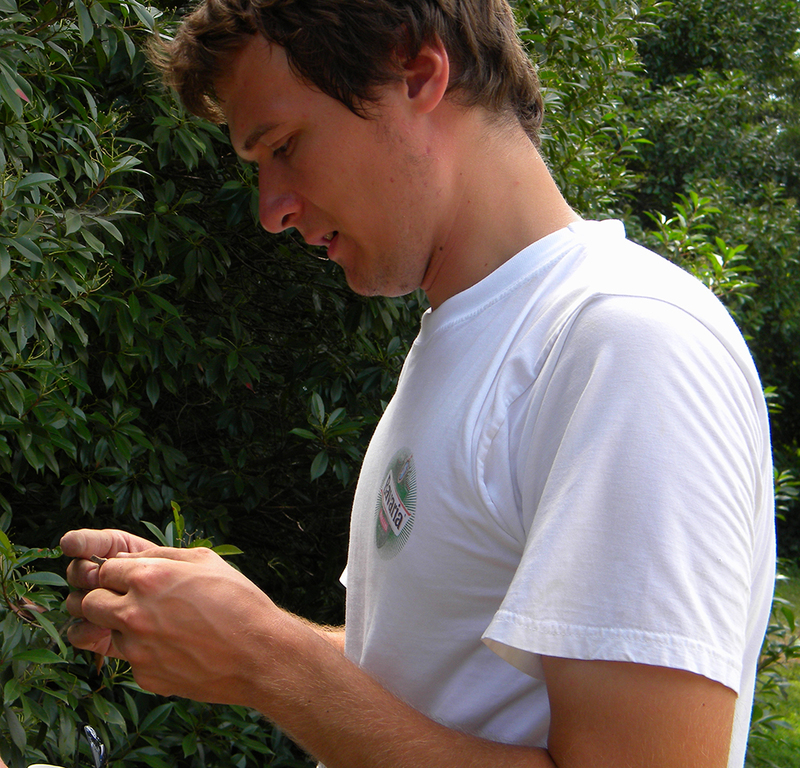 They say that oyster shells were given to chickens in the yard. The chickens would eat the shells to aid in their digestion. 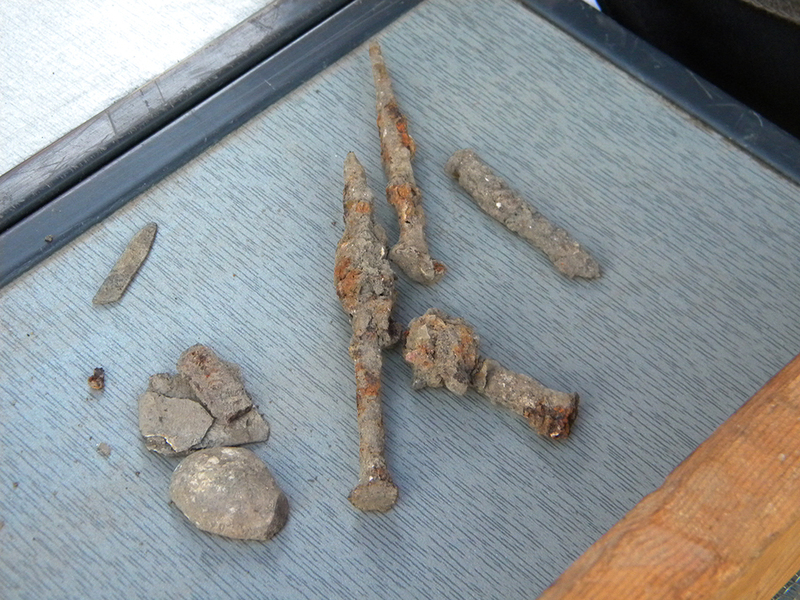 They have found other evidence of a chicken coop during the dig. 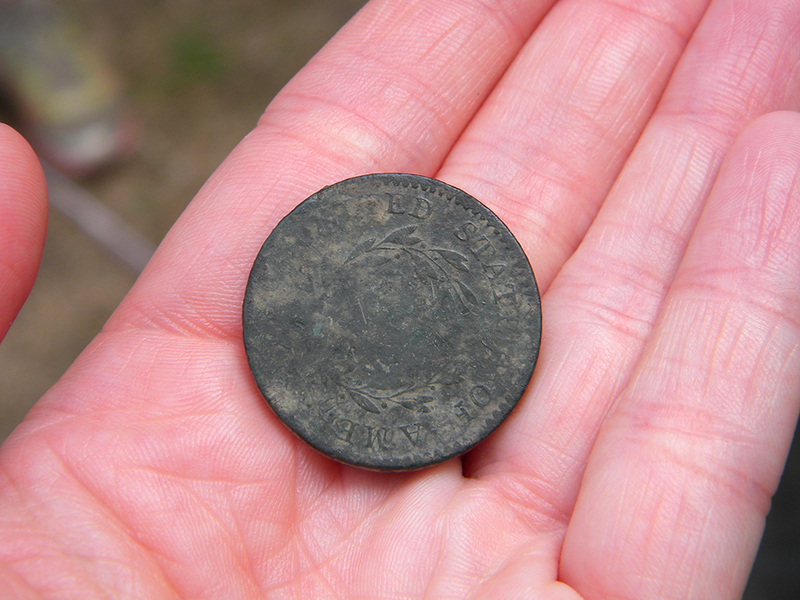 One of the most exciting finds so far this year is this 1794 metal coin. The back of the coin. 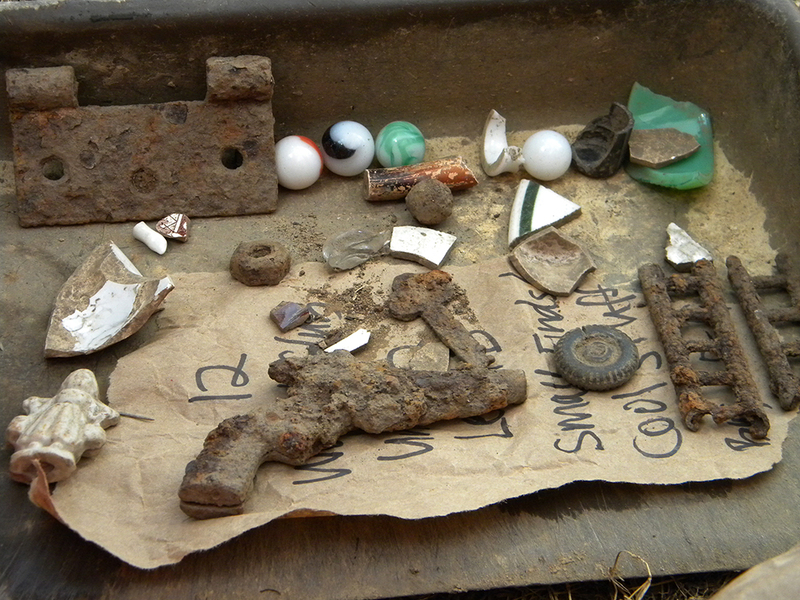 The students had some of their finds on display, including a metal toy gun, marbles, a door hinge and other objects. 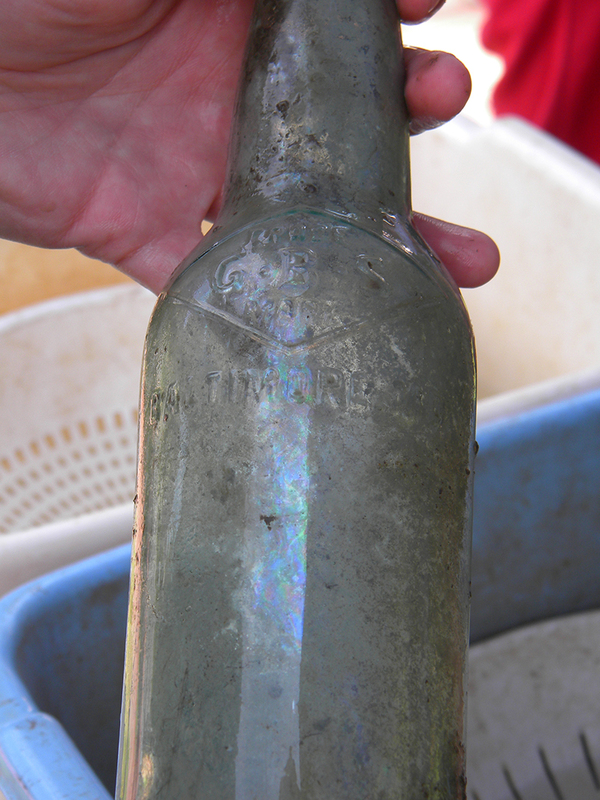 The students found this glass bottle with the word ‘Baltimore’ stamped on it. 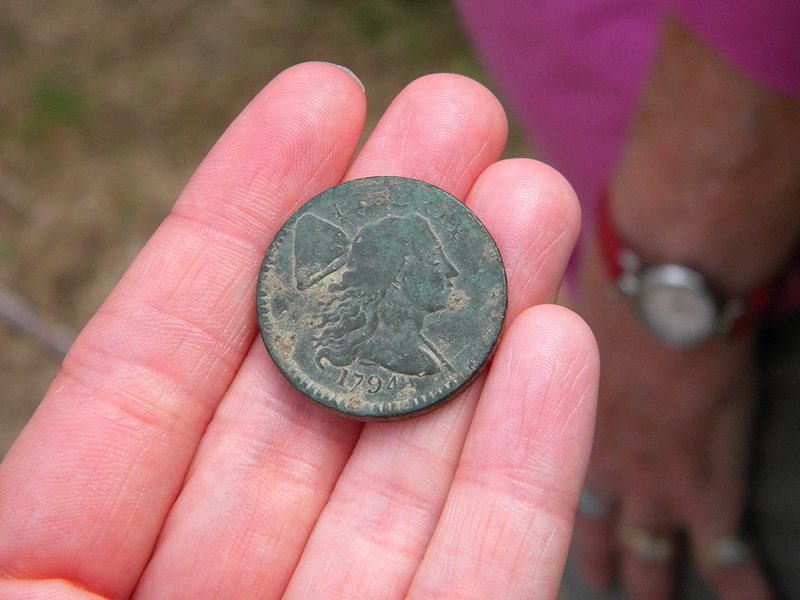 Funds for the dig were raised by Historic Easton. 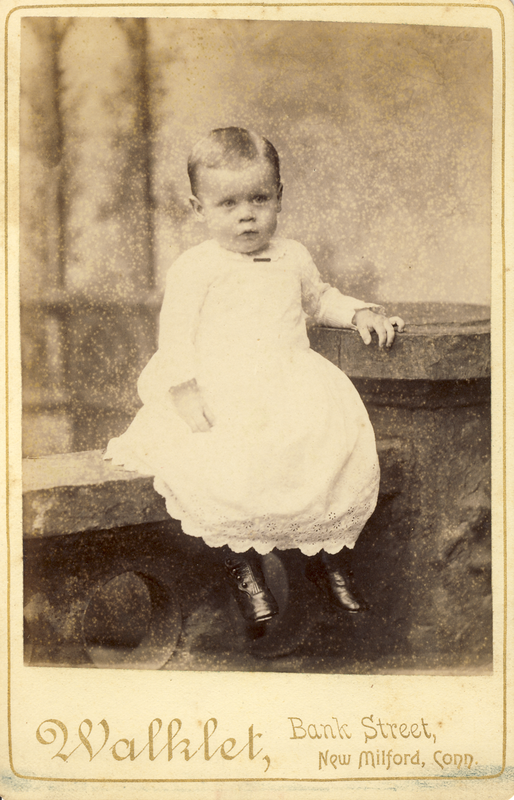 You can learn more about The Hill on the Historic Easton web site. If you would like to help support future digs, please click the ‘Donate’ button on the Historic Easton homepage. Open House at “The Hill” archaeological site today – The Star Democrat: Local. Hope my local readers can join us today! 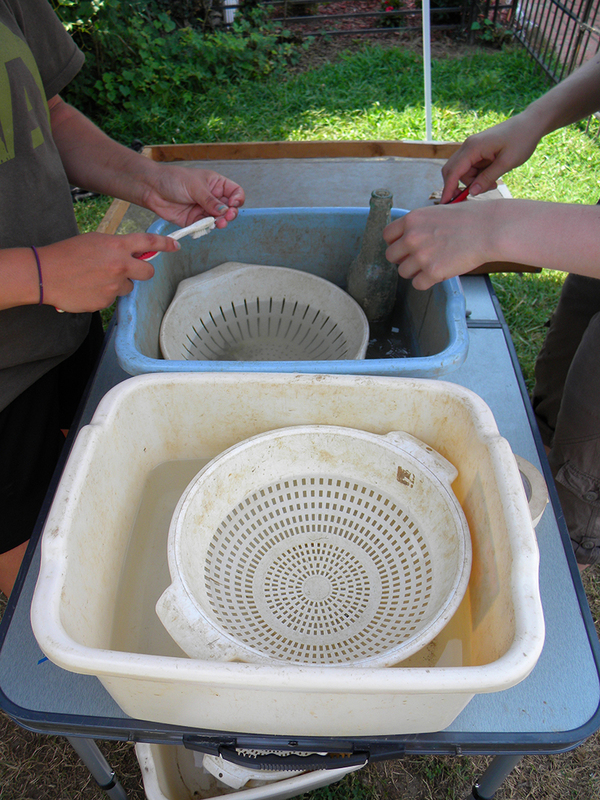 Student Archaeologists Dig up Easton’s Past – WBOC-TV 16, Delmarvas News Leader, FOX 21 –. 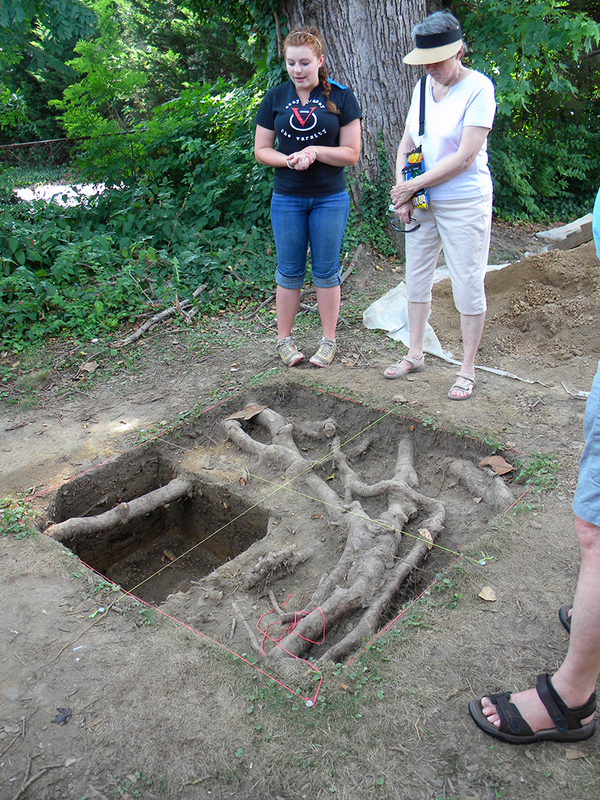 More coverage of the archaeological dig happening in Easton at the link above! UMD Uncovering Oldest U.S. Community of Free Blacks? UMD Uncovering Oldest U.S. Community of Free Blacks? | UMD Right Now :: University of Maryland. I hope everyone in the area can come and be a part of the archaeological dig on The Hill here in Easton. See the link above for more information. Be sure to check out the latest issue of Shades of the Departed magazine. Not only is the issue chock full of school days memories and vintage photos, but I was given the opportunity to tell the Friends Album story (see page 36). Enjoy! More exciting details about this historic African American neighborhood in this article! 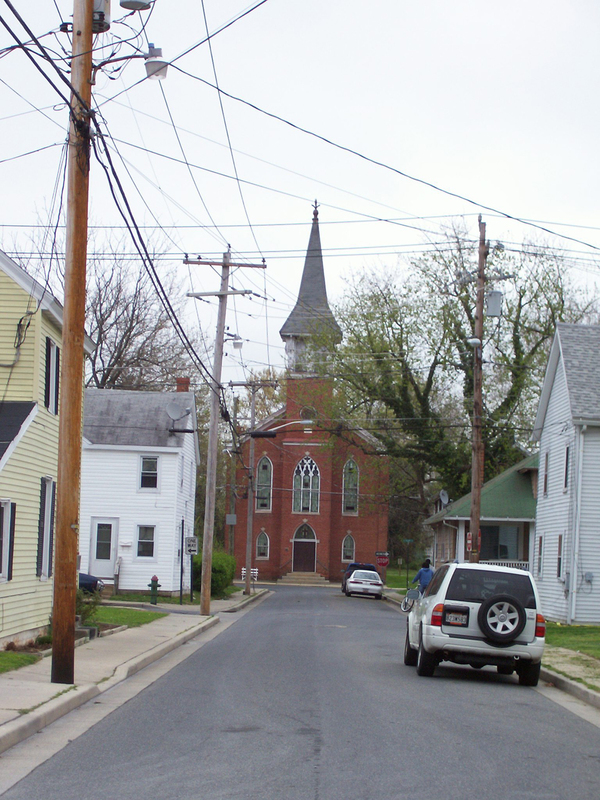 The Asbury AME church dominates the view down South Lane in The Hill neighborhood in Easton. when he visited Easton, are slated to receive preservation funds in Governor Martin O’Malley’s budget this year. If you are interested in learning more about The Hill, donating towards the preservation and archaeological work, or getting involved as a volunteer, please visit the Historic Easton web site or send us an email!